The weighted cutting bar, in addition to having silicone bead strips along the straight edge and base plate, provides additional grip for materials, eliminating the need to manually hold materials in place. 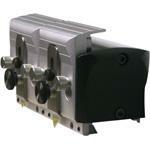 An easily interchangeable textile cutting head provides additional substrate cutting versatility. Adjustable mounting brackets allow the Evolution-E2 to be affixed to any table, regardless of its straightness or levelness. The adjustable levelers ensure straight and accurate cuts on any surface - to within .008" over the entire length of the cut, up to 144". The Evolution-E2 features an extruded alloy cutting base and a high-performance double cutting head design that relies on long lasting Graphik blades. These unique reversible blades cater to both left- and right- handed operators and cut materials up to 1/2". The blades can also be set at different depths, allowing the first blade to score the material and the second blade to cut through it in a single pass. Also included is one medium-duty utility blade holder that accepts standard utility blades and cuts up to 3/8" thick. High-Performance Bi-Directional Cutting Head. Includes Four Interchangeable Blade Holders. Easy to adjust blade depth with integrated depth guidance allows easy and exact cutting. A sturdy torsion bar allows single operators to lift and control the entire cutter bar from a single end (either side). 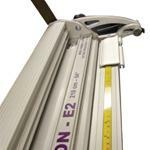 The adjustable levelers ensure straight and accurate cuts on to within .008" over the entire length of the cut. 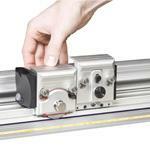 Switchable cutting tracks for general purpose and textile cutting. 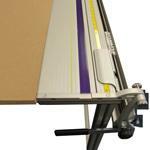 The built-in textile cutting track and textile cutting attachment (included) add the final refinements to the most versatile, accurate and simple-to-use, wide-format cutting system ever. When not in use, the cutter bar’s swing-over capability allows it to be folded under the cutting table or workbench, resulting in an unobstructed workbench surface. 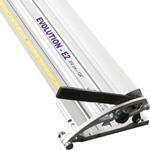 Adjustable mounting brackets allow the Evolution-E2 to be affixed to any table.